The Netherlands – Vivitek, a leading high-end specialist of video presentation products, is returning to the RAI as a Silver Sponsor for ISE2014, as it unveils not one, but three of its next generation large venue projectors. The DX6831 has XGA resolution, whereas the DU6871 and DW6851 feature WUXGA and WXGA resolution respectively. All models come with a raft of the latest display and connectivity technology on board including 3D capability. The DX6831 as well as the DU6871 and DW6851 are designed for large spaces where a versatile, high brightness projector is required. With 8000 ANSI Lumens for the XGA and 7300 and 7000 ANSI Lumens of brightness each for the WUXGA and WXGA models, projecting vibrant images from a distance is easy. All models feature a high contrast ratio of 3000:1 for deep blacks and rich colours. Connectivity options are numerous and include HDMI v.1.4, DisplayPort and DVI-D. In addition, the projectors are equipped with the HD-BaseT protocol receiver, capable to transmit HDMI quality video and audio together with Ethernet over up to 100m, using inexpensive CAT 5e or CAT 6 cables. 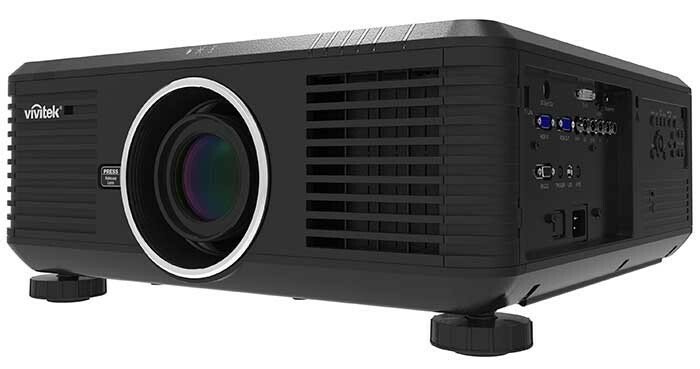 "Reliability is important for any projector, especially one that could be integral to a performance in front of hundreds of people," comments James Hsu, Director EMEA Operations at Vivitek. "The projectors support heavy duty 24/7 operations, with dual-lamp switching technology for zero downtime. In addition, projector status can be monitored at all times through Cat-5/6 cable via an RJ-45 interface." For maximum versatility when projecting, both models feature a centred lens, with motorised focus and zoom, as well as horizontal and vertical shift. A total of seven lens options are available for both models, ensuring the content displayed looks its best at all times.